“(I) played around with the idea of using Chebe Cinnamon Roll Mix for my crust instead of making pie crust from scratch. 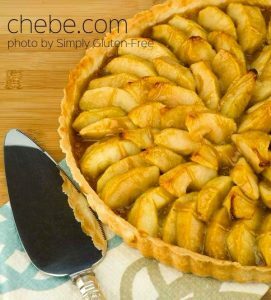 It could not have been simpler and the slightly sweet, cinnamony crust is a great complement to the apples and caramel in the tart. A couple things you need to know about this tart – the brown sugar mixture tends to seep out of the tart pan so I always wrap a piece of foil around the pan and then place it on a foil lined baking sheet to bake. This prevents having to clean up a mess. But you need to get the tart out of the pan before the brown sugar mixture cools off too much or it can be a tad difficult to get the ring of the tart pan to release. But not to worry, if it cools too much, just pop it back into the oven for 5 minutes and all will be well. Preheat oven to 375F. Lightly spray an 11 inch tart pan with a removable bottom with non-stick cooking spray. Line a baking sheet with foil. Combine the Cinnamon Roll Mix, eggs, 3 Tbsp oil and water (or milk) in a mixing bowl. Stir to combine the ingredients. Pour the dough out on a clean work surface and knead until smooth, 1 – 2 minutes. Place a piece of waxed or parchment paper on a work surface, top with the dough and then another piece of waxed or parchment paper. Roll into a 13 inch circle. Gently transfer the dough to the prepared tart pan. Wrap a sheet of foil around the outside of the tart pan. 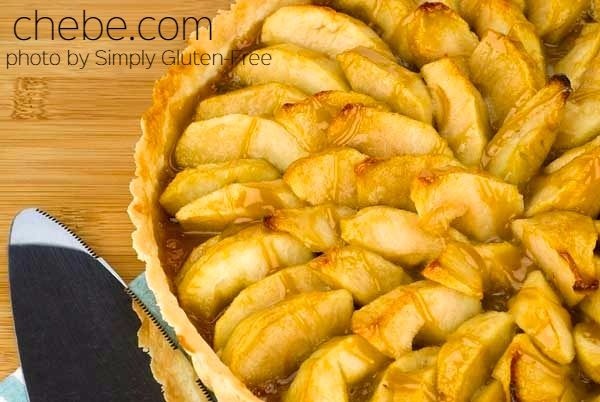 This will keep your oven clean as the caramel tends to seep out while the tart is baking. Put the sliced apples in a large mixing bowl and squeeze the lemon juice in. Toss to coat. Add the brown sugar and salt. Mix until the apples are completely coated with the brown sugar. Arrange the apples in a circle around the outer edge of the pan overlapping each other slightly. Continue to arrange the apples in concentric circles working toward the center of the pan. Make sure the apples fit snuggly. Pour the juices accumulated in the bowl over the apples and drizzle on the melted butter. Bake for 55 to 65 minutes or until the apples are tender when pierced with a knife. Check the tart after 35 minutes. Once the crust and the tips of the apple slices have browned, lay a sheet of foil over the top of the tart and continue baking. Let tart cool in the pan for 10 minutes, then remove the foil and outer ring of the tart pan and continue cooling on a wire rack. If the tart cools too much before removing the outer ring of the pan, the caramel will harden making it difficult to get the tart out of the pan. If this happens simply put the tart in a warm oven (300F) for 5 minutes and it should come right out. While the tart cools make the caramel sauce. In a small sauce pan over medium heat, bring all the caramel sauce ingredients to a boil. Stir to dissolve the brown sugar. Continue cooking until the sauce is thick enough to coat the back of a spoon, about 5 minutes. Let the sauce cool slightly, then drizzle on top of the tart. Serve the tart warm or at room temperature.